Oak Plaza, on Oak between Tenth and Eleventh Streets, is the threshold of the Oakland Museum of California. 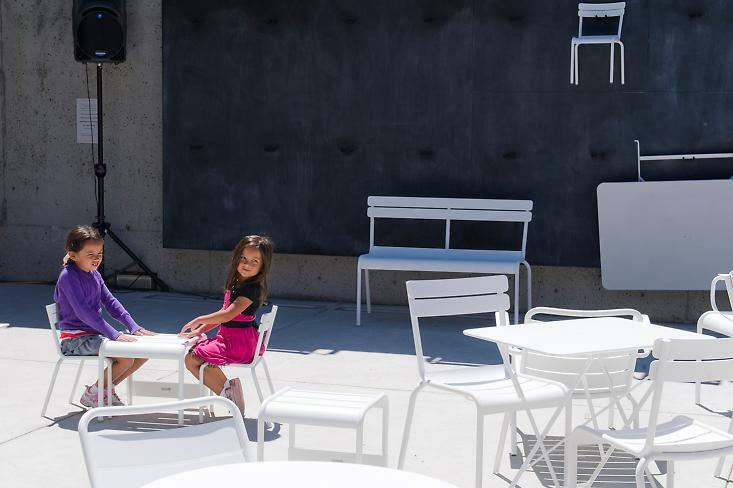 The Oakland Standard commissioned an architectural intervention to enhance this area, OMCA's main entrance, by making it a more dynamic, convivial, and flexible space. With a new front porch, the Museum welcomes the public in and extends its presence into the city. Jensen Architects, a Bay Area architecture firm, were asked to develop an interactive installation. The resulting "kit" comprises furniture that can be used and adapted to diverse purposes–a space for lunch, meetings, demonstrations, workshops, or performances. 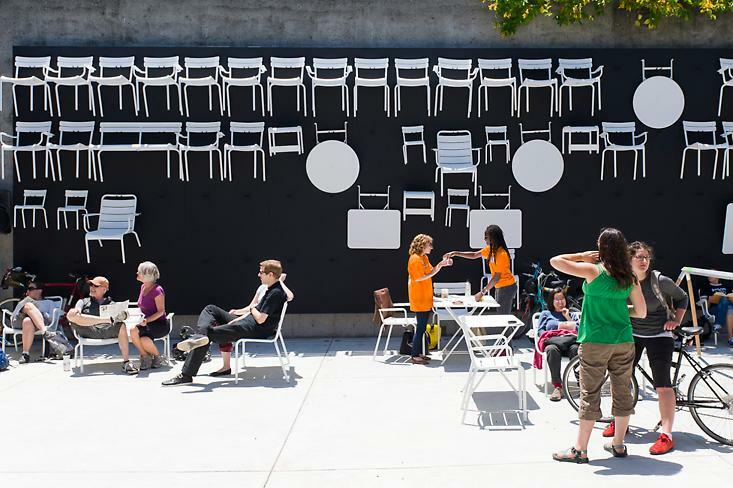 In the final design, a hundred-plus pieces of furniture hang on a grid of hooks installed against a giant chalkboard on the south wall of Oak Plaza. Visitors, and Museum staff and volunteers, are invited and encouraged to take the furniture down and arrange it to suit their own purposes. The furniture can be later returned to its hanging position, or not. The installation will remain on Oak Plaza until July 2012. The project was developed as a transformable tool kit serving new public programming and special events at the Oakland Museum of California. Sited in the austere terraced-concrete entry plaza of the Museum, the project creates an outdoor living room for the community. The installation was conceived as a “wall painting with chairs”; simple metal garden chairs are hung from hooks like chairs in a Shaker house. The composition of chairs and tables suspended on the wall initially creates a strong graphic impression, then comes into three-dimensional relief, and finally expresses itself as an interactive participatory piece where staff and visitors can create multiple seating arrangements in response to different events and gatherings. Architectural rendering by Jensen Architects. This interview with Mark Jensen from OMCA's Inside Out member magazine (August 2011) gives more context. Growing up in nearby Piedmont, architect Mark Jensen was a frequent visitor to the Oakland Museum of California. “I probably could have drawn the floor plans from memory,” he says, only half joking. Now, he has designed OMCA’s latest addition—a dynamic space for public programs, special events, and everyday visitors. 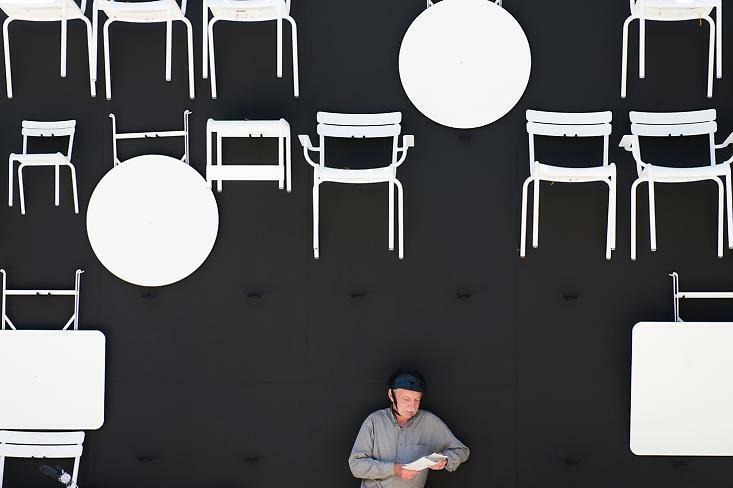 Sited in the Museum’s terraced Oak Street entry plaza, the installation—which opened in July—features a bevy of metal garden chairs and small tables hung from hooks on a prefabricated surface, creating a striking visual piece easily modified by staff and visitors for different events and occasions. It’s part of a series of Bay Area cultural spaces designed by Jensen; he’s recently worked with SF MOMA, the Sonoma County Museum, and the Emeryville Center for the Arts, among others. Jensen’s functional style has earned him a reputation as a leader in designing not just visually iconic pieces, but practical and progressive work that enhances the relationship between museum and public. Inside Out chatted with Jensen about architecture, cultural collaborations, and OMCA’s new event space. Inside Out: You used to come to the Museum as a kid. How was your experience different when you revisited it as an architect? Mark Jensen: Aside from my childhood memories, I think the Museum is an incredible piece of architecture. I’d put it in the top ten buildings in the Bay Area, in terms of contemporary architecture. The way the building is completely buried underground and open to the city is a radical conception. I love the building, so I was certainly drawn to this project. IO: What appeals to you about working on public cultural spaces? MJ: I’m interested in work that’s part of a larger cultural dialogue. Houses, offices, and shops can engage audiences in a broader dialogue, but it seems that cultural facilities—museums, galleries, anything arts related—are automatically more connected to that conversation. IO: What are some of the factors you take into consideration as you develop these projects? MJ: I’m interested in how architecture sets up relationships—between a city and its occupants, or in this case, a museum and its visitors. You’re writing the script for a play of how life unfolds after you do a building. It’s almost an inside-out way of thinking, making a place for things to happen rather than something to look at from the outside. IO: Is there a growing architectural tendency to think of cultural spaces from the inside out? MJ: Yes and no. There are certainly architects who just want to make formal conceits, and next generation, there will still be people doing that. But a unique aspect to our times, I think, is breaking down divisions between how things are made and how things are consumed, making that process more transparent. Seeing what’s behind the scenes in a museum, not just the paintings on the wall. I think people are interested in immersive environments, where they are involved in the full process of creation instead of prepackaged, shrink-wrapped consumption. IO: How will the OMCA project fit in with your idea of establishing relationships? MJ: It goes back to the building’s original design, this radical idea that the city would sort of thread its way through the space, that the building wouldn’t be something you just bump up against and then go inside. I see the Oak Street plaza right now as a space that people just pass through, but the programming the Museum is working on for that space, combined with our project, will make it a place for things to actually happen. The building’s original concept was very poetic, and this project is a way of reintroducing those ideas by creating a space where you’re not yet in the Museum but off the street, and still part of the city somehow. If our modest little project can help restore or push forward some of the building’s original concepts, then it will be a success.